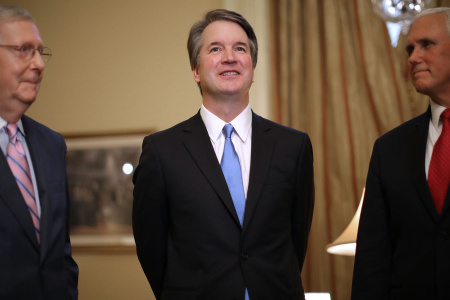 President Trump has nominated Brett Kavanaugh to the U.S. Supreme Court to fill the vacancy left by retiring Justice Anthony Kennedy. If confirmed, Trump’s choice would solidify the high court’s conservative majority and continue the president’s push to shift the federal bench to the right. Trump announced his choice with a prime-time address from the White House East Room. Since 2006, Kavanaugh has served on the U.S. Court of Appeals for the District of Columbia Circuit, often called the nation’s second most powerful court. He was appointed to that post by President George W. Bush, after serving as Bush’s White House staff secretary. Kavanaugh graduated from Yale Law School and clerked for Kennedy in the mid-1990s. Kavanaugh later worked with independent counsel Kenneth Starr during the investigation of President Bill Clinton.